Can Exercise Make a Headache Go Away? Headaches can be painful, throbbing experiences that derail your to-do list and make you feel irritable. Fitness-minded individuals might wonder whether working out with a headache can effectively address headaches as an alternative to popping some pain medication. In some instances, exercise might help make you feel better. However, persistent headaches could indicate that something more serious is happening. If exercise is causing headaches or making them worse, back off the activity to better assess the situation. Exercise can worsen headaches but might also help to prevent them. Exercising triggers headaches among 70 percent of Americans who commonly experience headaches, according to Fitness Magazine. Headaches occur when blood vessels around the brain become inflamed, causing pain due to stretched nerves. Although going to the gym with a headache might make some headaches go away, others might experience greater discomfort from all the physical activity. Read more: What Happens to the Brain When You Get a Headache? Exercise can decrease pain experienced during a headache because physical activity can release the body's feel-good endorphins. These natural painkillers help block the discomfort caused by the stretched nerves and inflammation. Working out can boost blood flow to the brain and reduce muscle tension and fatigue — all of which help minimize blood vessel inflammation. If you are lifting weights, Paul Christo M.D., writing for Men's Health, suggests pouring cold water over your head. It sounds uncomfortable, but may ease the pressure in your head by constricting the blood vessels. U.S. News & World Report noted that a study published in the journal Neurology suggests that teens with chronic headaches have three factors in common: being overweight, smoking and not exercising enough. According to the study, teens who fit all three categories are more than three times as likely to experience headaches compared with teens who do not have these characteristics. There's not a large body of evidence supporting the idea that exercise can make migraines go away. One possibility is that migraine exercise contributes to discomfort because of higher blood pressure and increased heart rates. 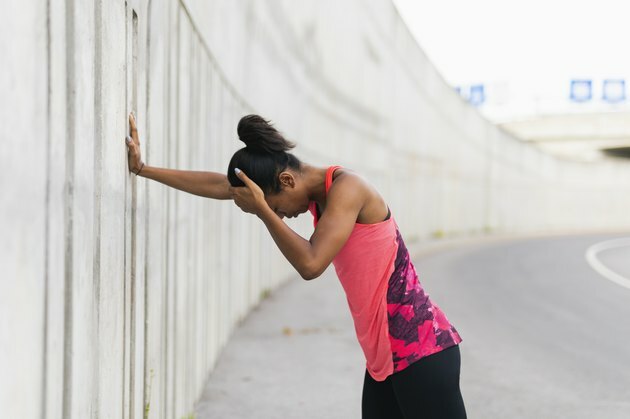 Depending on individual makeup and normal exercise habits, migraine sufferers might feel better after working out, but they might also experience exacerbated discomfort and a worse headache after working out. You can help exercise do its job by drinking plenty of water, since dehydration can contribute to headaches, according to the American Migraine Foundation. Try to breathe in an even, measured way, as improper breathing can also cause headaches, especially for weightlifters who hold their breath while straining to lift objects. Avoid alcohol and caffeine before or during exercise and apply cold compresses when necessary to soothe muscle discomfort as this too can lead to headaches. Avoid overheating by exercising during cooler parts of the day. Relaxing through yoga may also help by directing your focus to deep breathing, relaxation and the elimination of stress, according to Yoga Journal. Breath work or pranayama, as it is known in Sanskrit, is a 5,000-year-old system of calming both your body and mind. If your headaches persist, however, see a doctor. Fitness Magazine: Is Exercise Giving You a Headache?